From Paris take Highway 79 N. towards Paris Landing. Go 4 miles to Nobles Rd. (You will see a sign that says Mammy & Pappy's Bed & Breakfast) Turn right and go 1.7 miles to a stop sign. Turn left at that stop sign, you are now on Elkhorn Rd. Go 3.4 miles and turn right at Elkhorn Cemetery (on your right), which is still Elkhorn Rd, and go another 1.8 miles to 7615 Elkhorn Rd. and turn left in to Mammy & Pappy's B&B. 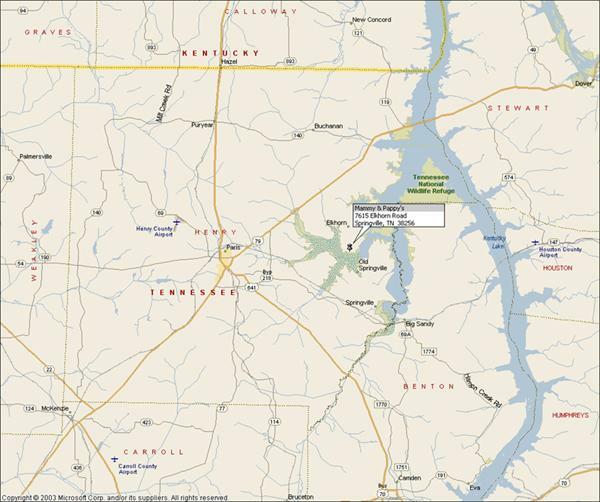 From Paris Landing State Park, follow highway 79 toward Paris 6.3 miles and turn left on to Oak Grove Road South. You will see a sign that says Mammy & Pappy's B&B. Go 3.7 miles to a stop sign and turn left (which is Elkhorn Rd.) Go 1/2 mile and turn right at cemetery (which is still Elkhorn Rd.) and go 1.8 miles to 7615 Elkhorn Rd. and turn left in to Mammy & Pappy's B&B. From Paris via highway 69A south--Follow highway 69A approximately 8 miles, cross highway 218 and continue on highway 69A to Had-A-Call Grocery and turn left on to Poplar Grove Rd. 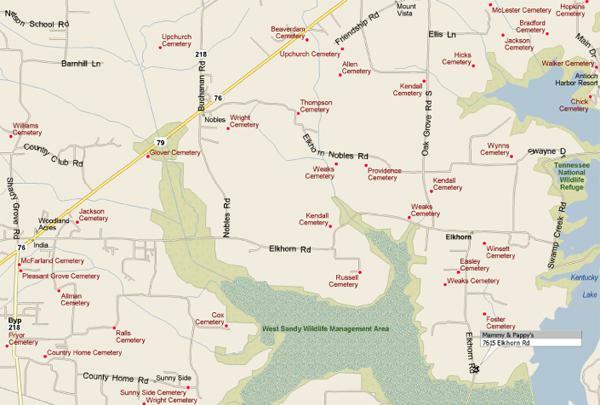 Go approximately 1.5 miles and turn left at cemetery onto Elkhorn Rd. and go 3.5 miles and turn right in to Mammy & Pappy's B&B (7615 Elkhorn Rd.). From Big Sandy, Tennessee via highway 69A--Go North toward Paris 5.5 miles to Had-a-Call Grocery and Poplar Grove Road. Turn Right and go 1.5 miles and bear to the left onto Elkhorn Rd. Go 3.5 miles to B & B on your right.